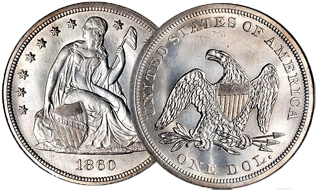 The Seated Liberty dollar coin was struck by the United States Mint from 1840 to 1873. Seated Liberty dollar coins were initially struck only at the Philadelphia Mint, however, in 1846, production began at the New Orleans facility . In 1866, “In God We Trust” was added to the dollar coin following its introduction to United States coinage earlier in the decade. Seated Liberty dollar coin production was halted by the Coinage Act of 1873.